You are here: Home / balanced / Have a Positive Outlook on Life . . . in 3 Minutes! Are you a glass half-empty or glass half-full type of person? Do you always look to the negative or try to find the positive? For many years I swayed toward Miss Negativity. I could have an almost-clean house, and I’d mope over the one area not yet sparkling. Or I’d read a dozen great reviews of my books and then cry over the one negative comment. For years I battled this, and it was only recently I realized how far I’ve come. Through the years I’ve developed a habit that has guided me to to having a more positive outlook, and it has brought joy and thankfulness to my soul. My work and home life is better for it too! And the habit only takes three minutes! One day, unable to function in the midst of all my numerous concerns, I rushed to my room, climbed under my duvet, and cried. Then, realizing the crying wasn’t to get me very far, I focused on God instead. I pictured God on His throne and Jesus by His side. I pictured those bowed before Him declaring, “Holy, holy, holy.” I pictured the earth spinning under His direction and His gaze of love looking down at me in my miserable state. And I imagined a look of love and compassion in His gaze. When I climbed out from my bed, my heart was changed. My burdens were lifted, and I had a more positive outlook on life. And when I looked at the clock, I realized it had only been three minutes. Three minutes reminded me of God’s place and His power. It took my thoughts off myself and my worries, and it put those thoughts on Him. I’m sure my limited imagination barely grasped the awesomeness of being in His presence, but that exercise helped me. Seeing God—imagining Him—put my mind at ease. He is a great and loving ruler. My tasks and worries are tiny in comparison to Him! The next time I took my three-minute escape I pictured myself lifting my small concerns and handing them over. Once we attempt to wrap our minds around the Lord’s greatness, power, glory, victory, and majesty, it’s easy to adore Him, and if we’re busy adoring Him, then it takes our mind off our concerns. It also helps me to realize that God’s in control. He can guide me, help me, and give me peace. And He does all that as I fix my mind on Him! Read the rest of this post over at forthefamily.org. 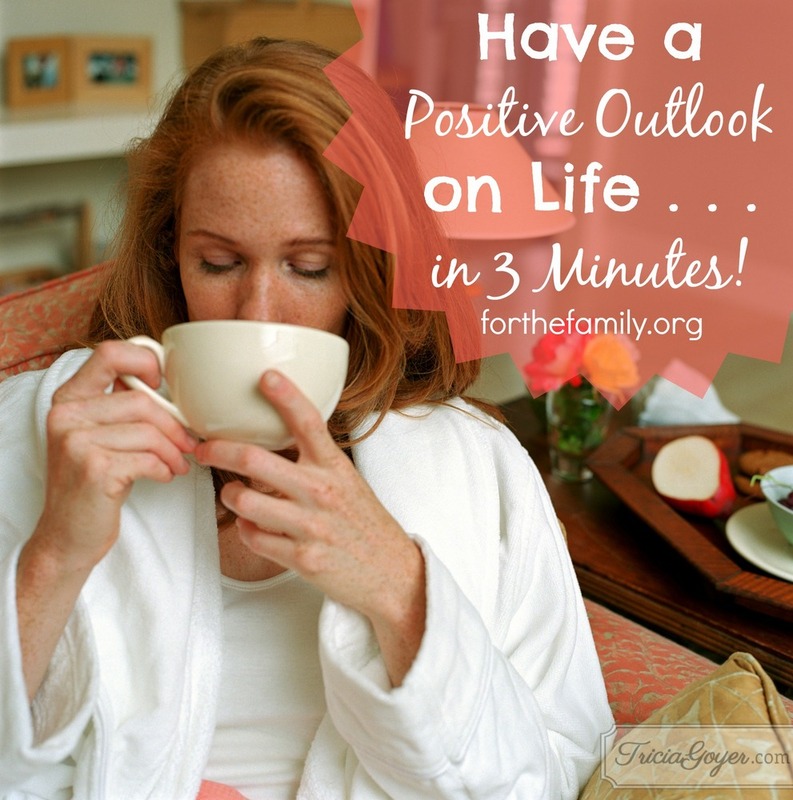 Need a more positive outlook? 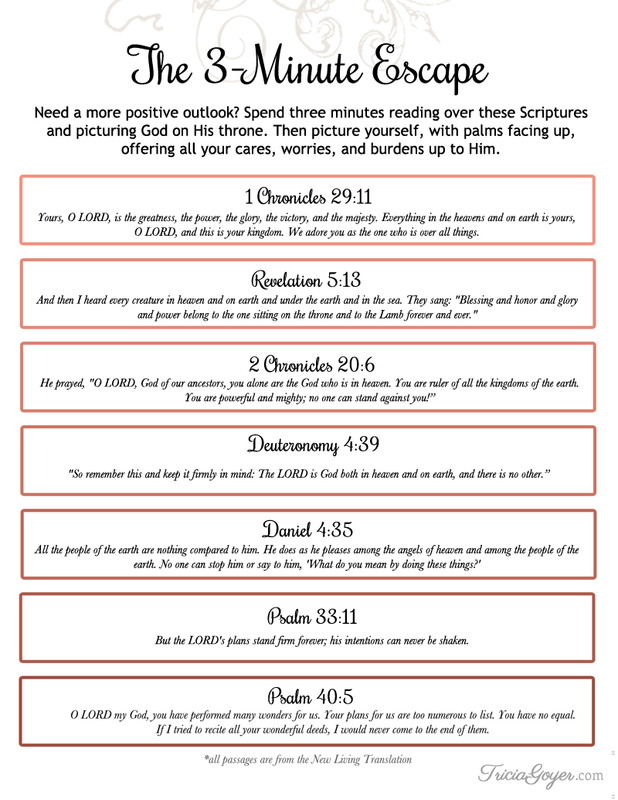 Spend three minutes reading over these Scriptures and picturing God on His throve. Then picture yourself, with palms facing up, offering all your cares, worries, and burdens up to Him. Wonderful post this morning. God is so glorious that we can’t imagine all that he is. That doesn’t mean that we shouldn’t focus on him and his greatness. I like to think of him as a great light. The Bible says that when this earth is finished and we go to live with God we will not need the sun or the moon because God will be our light.